Received June 5, 2018; Revised July 28, 2018; Accepted July 29, 2018. Although common femoral artery endarterectomy (CFAE) is regarded as the standard treatment modality for common femoral artery (CFA) disease, availability of advanced endovascular techniques has resulted in an increased number of CFA disease being treated. We evaluated clinical outcomes in a contemporary series of patients who were treated for CFA disease using endarterectomy alone or combined with endovascular treatment. We retrospectively reviewed 46 patients from November 2001 through December 2007. The treated lesions were divided into 4 groups based on operative procedure: group I (n=11), CFAE alone; group II (n=15), CFAE and iliac artery (IA) endovascular treatment; group III (n=6), CFAE and superficial femoral artery (SFA) endovascular treatment; group IV (n=14), CFAE and IA and SFA endovascular treatment or bypass surgery. The degree of CFA steno-occlusion was not different among the groups. The 3-year primary patency rates of each group were 88.9±10.5%, 60.0±14.5%, 62.5±21.3%, and 83.9±10.4%, respectively. The 3-year primary assisted patency rates were 100%, 70.0±13.0%, 62.5±21.3%, and 89.3±10.4%, while 3-year secondary patency rates were 100%, 80.0±13.0%, 62.5±21.3%, and 92.3±7.4%, respectively. There was no procedure-related mortality. Significant improvement of ankle-brachial index was achieved in all groups. CFAE alone is the treatment of choice for excellent patency and clinical improvement in steno-occlusive lesions confined to the CFA. In multiple steno-occlusive diseases, this procedure could be combined with endovascular procedures to reduce the operative risk in conditions with high morbidity. Remarkable technological advances and device development in the field of endovascular treatment have lead to a significant paradigm shift in the treatment of peripheral artery disease (PAD). In many cases, endovascular therapy (ET) has become the first-line choice for patients with PAD of the superficial femoral artery (SFA) or iliac artery (IA) [1,2]. ET presents several distinct advantages over surgical revascularization . Most ET can be performed under local anesthesia, and patients benefit from reduced morbidity and mortality, shorter hospitalization, and quicker recovery to normal functional status. However, ET for common femoral artery (CFA) lesions remains controversial. Availability of more advanced endovascular techniques has resulted in an increased number of CFA disease being treated using an endovascular strategy. Placing a stent in the CFA is considered hazardous because of the risk of stent fracture, intimal hyperplasia, and sacrifice of the deep femoral artery (DFA), which is an important source of limb-preserving collateral flow in patients with advanced PAD [4,5]. Therefore, common femoral artery endarterectomy (CFAE) is still considered as the standard treatment for occlusive disease of the CFA. Endarterectomy was first performed on the SFA in 1947 by Portuguese surgeon Dos Santos  at the University of Lisbon. CFAE has a high technical success rate with low morbidity and mortality [7,8]. This can also be performed in combination with endovascular procedures as a hybrid technique, especially those with multi-level arterial occlusive disease. We sought to evaluate the clinical outcomes in a contemporary series of patients who were treated for CFA disease using endarterectomy alone or combined with endovascular treatment. This was a retrospective study which included patients who underwent CFAE for the treatment of occlusive disease in the CFA, either alone or in combination with the treatment of other vessel segments. Between November 2001 and December 2007, a total of 46 patients, including 43 males and 3 females, who underwent CFAE were included. The patients were divided into 4 groups based on the extent of the disease and the operative procedures: 1) group I consisted of 11 patients who underwent CFAE alone; 2) group II of 15 patients who underwent CFAE with simultaneous IA endovascular treatment; 3) group III of 6 patients who underwent CFAE with simultaneous SFA endovascular treatment; and 4) group IV of 14 patients who underwent CFAE with simultaneous IA and SFA endovascular treatment or bypass surgery. All patients had undergone preoperative peripheral vascular evaluation with physical examination and measurement of ankle-brachial index (ABI). The lesions were diagnosed with computed tomography angiography (CTA). Baseline patient demographics and procedural details were recorded at the time of the procedure. Demographic and preoperative characteristics of the patients are shown in Table 1. Age and comorbidities were similar between groups. The ABI value is shown to be highest for group I. This is because this group consisted of patients whose lesions were confined to the common femoral artery. The degree of stenosis in the CFA was classified according to CTA images into 4 grades, as follows: minimal, 1%–49%; moderate, 50%–74%; high, 75%–99%; and occlusion, 100%. There is no statistically significant difference in stenotic severity among the groups (P>0.05, Table 2). Prior to operation, all patients were evaluated for clinical ischemic conditions according to the Rutherford classification. The distribution of patients in each group is shown in Table 3. In addition, the target lesions of the iliac and superficial femoral arteries were classified according to the TransAtlantic Inter-Society Consensus for the Management of Peripheral Arterial Disease (TASC II). Defining the incidence of group II by TASC in the iliac region, 4 cases fell into TASC B and 11 into TASC C. In the SFA region, 1 and 6 cases fell into TASC C and D, respectively. However, the SFA regions of group II patients could not be treated because the patients showed poor general condition. Even with the untreated SFA, we were able to achieve revascularization through the deep femoral artery, and succeeded in limb salvage. In the iliac region for group III, 2 and 4 cases were found to be healthy and TASC A cases, respectively. As the patients did not have hemodynamic problems, we did not treat them as target lesions. In the SFA region for group III, 2, 3, and 1 case were found to be TASC B, C, and D cases, respectively. In the iliac region for group IV, 1, 3, and 10 cases were found to be TASC B, C, and D cases, respectively. In the SFA region of group IV, 11 and 3 cases were found to belong to TASC B and D, respectively (Table 4). CFAE was performed using the standard technique. Heparin sodium (100 U/kg) was administered intravenously during the procedure. The CFA was exposed, from the circumflex femoral branches down to the femoral bifurcation. The CFA was opened longitudinally toward the SFA or profunda femoris artery. The plaque was peeled away from the vessel wall in the direction of the arteriotomy, and removed (Fig. 1). Suture tackings of the plaque to the posterior part of the adventitia were placed at the distal end of the endarterectomy site to avoid plaque lifting, dissection, or thrombosis. The endarterectomized luminal surface was carefully inspected to check for a debris-free surface area. Patch angioplasty was then performed routinely using a bovine pericardium patch (Fig. 2). Concomitant ET for iliac or femoro-popliteal lesions was performed if necessary. ET was simultaneously performed in an operating room suite with a mobile C-arm. After CFAE, a 6F to 7F sheath was inserted over a guidewire through direct puncture on the patch. Lesions were crossed with a 0.035-inch angled or straight hydrophilic guidewire, with or without a supporting catheter. Lesions were treated with primary stenting for iliac occlusive disease, and balloon angioplasty and selective stenting for distal lesions. Completion angiography was performed and sutures were placed at the puncture site. Typically, aspirin (100 mg) and clopidogrel (300 mg), as well as cilostazol (200 mg), were orally administered as loading dose on the day of the surgery. After the procedure, all patients were treated with aspirin (100 mg/d), clopidogrel (75 mg/d), and cilostazol (200 mg/d) for 3 months, and all other drugs except clopidogrel were continued, as long as side effects did not occur. ABI was performed to assess hemodynamic improvement. The patients were then followed-up every 1 to 2 months during the first 6 months, and every 3 months in the later period. During follow-up, patients with worsening clinical symptoms or a drop in ABI of more than 0.15 underwent CTA. Further procedures were performed at the discretion of the vascular surgeon. The postoperative ABIs are shown in Table 5. Postoperative ABI numbers improved for all patient groups. Particularly in group IV, patients that were treated for all lesions showed the highest level of improvement, increasing by 0.52, from 0.29 to 0.82. This is noteworthy compared to group II and group III. In our study, we had to perform 1 case of major amputation (above-knee amputation) in group II. The patient’s general condition was very poor, in class 6 of Rutherford; thus, we were only able to treat the patient’s inflow problem. As the patient’s outflow (SFA and DFA) was in bad condition as well, the patient had to undergo amputation on postoperative day 4. We also did 5 minor amputations, specifically 1 case of Chopart’s amputation and 4 cases of toe amputations. A total of 4 re-interventions were found across all groups. For 1 case in group I, re-endarterectomy was performed 8 months later. For group II, 1 case went through thrombolytic therapy after 7 months, and 1 case had angioplasty 13 months later. For 1 case in group IV, angioplasty of the SFA was performed 3 months later. There was no procedure-related mortality. At 3 years, the primary patency rates of each group were 88.9±10.5%, 60.0±14.5%, 62.5±21.3%, and 83.9±10.4%, respectively. The 3-year primary assisted patency rates were 100%, 70.0±13.0%, 62.5±21.3%, and 89.3±10.4%, while the 3-year secondary patency rates were 100%, 80.0±13.0%, 62.5±21.3%, and 92.3±7.4%, respectively (Fig. 3). The 3-year patency rates of group I and group IV were higher than that of other groups, but there were no significant statistical differences among the groups. Endarterectomy was first performed on the SFA in 1947 by Portuguese surgeon Dos Santos . CFAE has been the standard treatment for CFA occlusive disease for over 50 years. In this study, group I, which was treated by endarterectomy alone, showed excellent clinical improvement and longer patency. In this group, mean postoperative ABI was 1.01±0.1, and 3-year primary and secondary patency rates were 89.3±10.4% and 100%, respectively. Previous studies also reported favorable results of CFAE similar to those of our study. Mukherjee and Inahara  reported a 5-year patency rate of 94% in 29 patients. Kechagias and Ylonen  examined 90 patients who underwent 111 cases of isolated CFAE and reported 5- and 10-year freedom from ipsilateral revascularization rates of 68% and 50%. However, because of lack of a specific follow-up, this study did not have data on long-term patency. Ballotta et al. prospectively analyzed 117 patients who underwent 121 CFAE and reported that 7-year primary patency and assisted primary patency rates were 96% and 100%, respectively. In addition to these favorable results, CFAE can also be performed in conjunction with ET, known as a hybrid technique. Most of the cases in this study were performed as a hybrid technique. This hybrid technique can provide a less invasive but equally effective option, especially for patients with multi-level occlusive disease, and the efficacy of this method has been previously reported. Nelson et al. examined 34 patients who underwent CFAE with ET. The 1-year primary patency and primary-assisted patency rates were 84% and 97%, respectively. Kang et al. examined 65 CFAs in 58 patients and 37 procedures (56.9%) were performed as a hybrid technique. With a mean follow-up period of 27 months, 1- and 5-year primary patency rates were 93% and 91%, respectively. Because of rapid advances in ET, some authors have reported the results for ET in occlusive disease of the CFA; however, the results remain controversial. Stricker et al. reported on 33 stent-assisted angioplasty procedures of the CFA and bifurcation in 27 patients with a mean follow-up of 30 months; the cumulative primary patency was 86%. This study also showed no major complications or stent thrombosis, and all limbs showed primary hemodynamic success. On the other hand, Bonvini et al. analyzed 360 CFA lesions treated by balloon angioplasty and stent implantation. This is one of the largest studies regarding open or endovascular treatment of CFA. Restenosis and target lesion revascularization at 1-year were observed in 27.6% and 19.9% of patients, respectively, which were discouraging results. Despite advancements in endovascular technique, vascular surgeons hesitate to perform ET for the CFA because of its unique characteristics. The plaque of the CFA is too bulky and heavily calcified to treat with balloon angioplasty. This lesion often involves the femoral bifurcation, and distal embolization into the DFA or SFA can occur during ET . Since the CFA is the most used access site for endovascular or surgical procedures, stent implantation in this area can limit future surgical options and sacrifice collaterals provided by the DFA. In addition, the stent can be prone to fracture because of high mobility. ET presents several distinct advantages over surgical revascularization, such as the avoidance of general anesthesia, the rapid recovery time, and the lower morbidity. In this study, most of the patients underwent CFAE under loco-regional anesthesia and the procedure took a relatively short time. In addition, this study demonstrates low postoperative complication rates. As a result, this means that CFAE is also a less invasive, effective and durable treatment procedure. In group II, limb salvage could be achieved with inflow improvement by iliac arterial stenting and endarterectomy to build the in-line flow to the deep femoral artery, even in those with severe co-morbid conditions. Total vascular reconstruction in group IV who had far advanced lesions was helpful for clinical improvement and better patency. Thus, we could choose the combination of procedures according to the purpose of the procedure and the patient’s co-morbidity. This study has several limitations. First, this was a retrospective study, which could include selection bias. Second, it involved only a small group of patients and had a relatively short follow-up period. Thus, we could not show significant statistical difference between the groups. We just aimed to show the usefulness of CFAE for simple or complex vascular lesions. Lastly, most of the patients underwent a hybrid technique, so the effect of CFAE alone could not be quantified. In conclusion, CFAE is a safe, effective, and durable procedure for treating steno-occlusive lesions confined to the common femoral artery. Despite remarkable technological advances in endovascular therapy, CFAE should remain as the standard treatment for occlusive disease of the CFA. Even in multi-level steno-occlusive disease, CFAE with ET could be a valid procedural option, as a less invasive procedure for patients with high surgical risk. Fig. 1. Common femoral endarterectomy. (A) Preoperative computed tomography angiography showing a critical stenosis at the common femoral artery (B, C) Operative image showing that the atheroma plaque was peeling away from the vessel wall while remaining of adventitial layer. Fig. 2. Operative image showing that patch angioplasty was performed routinely using bovine pericardium patch to complete of endarterectomy. Fig. 3. Patency rate at 3-year. (A) Primary patency rate at 3-year. (B) Primary assisted patency rate at 3-year. (C) Secondary patency rate at 3-year. 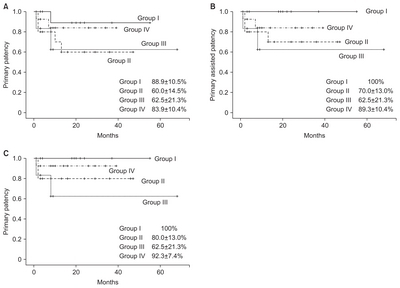 The 3-year patency of group I and group IV were higher than that of other groups, but there were no significant statistical differences between groups. Values are presented as number only. TASC II, TransAtlantic Inter-Society Consensus for the Management of Peripheral Arterial Disease; SFA, superficial femoral artery. DeRubertis, BG, Faries, PL, McKinsey, JF, Chaer, RA, Pierce, M, and Karwowski, J (2007). Shifting paradigms in the treatment of lower extremity vascular disease: a report of 1000 percutaneous interventions. Ann Surg. 246, 415-422. Gallagher, KA, Meltzer, AJ, Ravin, RA, Graham, A, Shrikhande, G, and Connolly, PH (2011). Endovascular anagement as first therapy for chronic total occlusion of the lower extremity arteries: comparison of balloon angioplasty, stenting, and directional atherectomy. J Endovasc Ther. 18, 624-637. White, CJ, and Gray, WA (2007). Endovascular therapies for peripheral arterial disease: an evidence-based review. Circulation. 116, 2203-2215. Andrews, RT, Venbrux, AC, Magee, CA, and Bova, DA (1999). Placement of a flexible endovascular stent across the femoral joint: an in vivo study in the swine model. J Vasc Interv Radiol. 10, 1219-1228. Ballard, JL, Sparks, SR, Taylor, FC, Bergan, JJ, Smith, DC, and Bunt, TJ (1996). Complications of iliac artery stent deployment. J Vasc Surg. 24, 545-553. Dos Santos, JC (1947). Sur la desobstruction des thromboses arterielles anciennes. Mem Acad Chir. 73, 409-411. Ballotta, E, Gruppo, M, Mazzalai, F, and Da Giau, G (2010). Common femoral artery endarterectomy for occlusive disease: an 8-year single-center prospective study. Surgery. 147, 268-274. Mukherjee, D, and Inahara, T (1989). 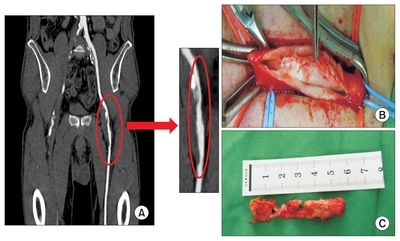 Endarterectomy as the procedure of choice for atherosclerotic occlusive lesions of the common femoral artery. Am J Surg. 157, 498-500. Kechagias, A, Ylonen, K, and Biancari, F (2008). 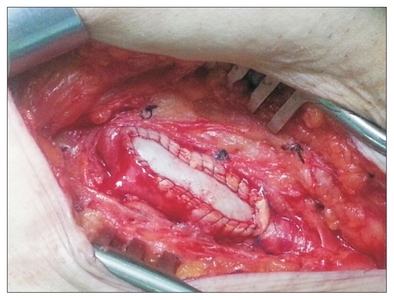 Long-term outcome after isolated endarterectomy of the femoral bifurcation. World J Surg. 32, 51-54. Nelson, PR, Powell, RJ, Schermerhorn, ML, Fillinger, MF, Zwolak, RM, and Walsh, DB (2002). Early results of external iliac artery stenting combined with common femoral endarterectomy. J Vasc Surg. 35, 1107-1113. Kang, JL, Patel, VI, Conrad, MF, LaMuraglia, GM, Chung, TK, and Cambria, RP (2008). Common femoral artery occlusive disease: contemporary results following surgical endarterectomy. J Vasc Surg. 48, 872-877. Stricker, H, and Jacomella, V (2004). Stent-assisted angioplasty at the level of the common femoral artery bifurcation: midterm outcomes. J Endovasc Ther. 11, 281-286. Bonvini, RF, Rastan, A, Sixt, S, Noory, E, Schwarz, T, and Frank, U (2011). Endovascular treatment of common femoral artery disease: medium term outcomes of 360 consecutive procedures. J Am Coll Cardiol. 58, 792-798. Lam, RC, Shah, S, Faries, PL, McKinsey, JF, Kent, KC, and Morrissey, NJ (2007). Incidence and clinical significance of distal embolization during percutaneous interventions involving the superficial femoral artery. J Vasc Surg. 46, 1155-1159.